Click to hear a recording by Faith Ladies' Choir made on 6/17/2007. Members were Shirley Burkett, Anna Bocklage, Debbi Hochgesang, Alma Rissky, Barbara Tebo and Lois Werth. Dr. Betty Baker was the accompanist. 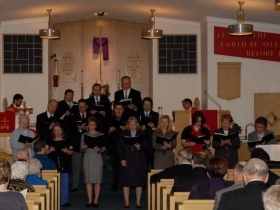 For more information on our choir, such as rehearsal schedule, etc., please see our Service & Fellowship page. In the mid-1800s, an Anglican bishop wrote a book that questioned whether Moses had really written the first five books of the Bible and denying the doctrine of eternal punishment in Paul's book of Romans. This caused a widespread controversy throughout the Anglican church. Samuel J. Stone (1839-1900), the curate of a poor London parish, was deeply disturbed by the debate. In 1866, to instruct people in the truth and to combat the attacks on the Bible, he wrote a collection of twelve hymns based on the Apostle's Creed. "The Church's One Foundation" is from the Ninth Article: "I believe in the holy Christian church, the communion of saints." The hymn was set to music by Samuel Sebastian Wesley (1810-1876), grandson of Charles Wesley (1707-1788), who wrote over 6,000 hymns, and great-nephew of Charles's brother John Wesley (1703-1791), who founded the Methodist Church. The name of the tune is "Aurelia." It was from this cauldron of doctrinal dispute and crisis over a century ago that one of the church's most beloved hymns came into being. Samuel Stone's faith in the inspiration of Scripture, his refusal to compromise, and his conviction of the Lordship of Christ has given us this stately hymn.